House your components with confidence behind the tempered safety glass door of the new Cranley Collection component stand. Complete in our signature Ravenwood Black finish this sleek vertical design offers a contemporary way to maximize your living space. Adjustable interior shelves create custom space to store your components or add a touch of personal style. With a nod to its mid-century modern design, the Bromma TV Stand are where style and functionality meet, highlighted through careful craftsmanship, while providing ample storage in one compact piece that will complement any space. Featuring one oversized shelf and a smaller rectangular shelf, The Bromma simplifies showcasing your dvd collection, xbox, books, and television, while an extra drawer guarantees you'll never misplace the remote. Classic clean lines detract from dust, eliminating hard to reach corners and keeping to its subtle design aesthetic. A likely focal point to your living space, the Bromma Stand represents a place for family and friends to gather. Shelves available in white, oak and aqua. An ideal entertaining piece for any living space, Mid-Century design and modern functionality meet in perfect harmony to create the Glenmore TV stand. Featuring stylish storage and ample space for stowing all of your favorite DVDs, media accessories, and entertainment necessities, the piece boasts open and discreet storage, allowing one to stay organized, keeping friends and family gathered around, enjoying time together in a clutter-free zone. Showcase your flat screen, framed photos, paintings, and decorative accents to create an area that's all your own. Calling all entertainers with the Jackie TV stand, a beautifully crafted, highly functional, and versatile blend of Mid-Century and modern design. Featuring plenty of shelving and ample storage space perfect for stashing DVDs, tablets, DVD or Blu-Ray systems, this piece showcases your TV and ensures you'll never misplace your remotes or trip over any wiring. Elongated shelving offers open storage, while a convenient cabinet conceals and keeps your media accessories from being lost and avoids mess. Invite the family and friends over, you're the entertainer of the year. The Liberty 70.86 Mid-Century Modern TV Stand is mid-century modern at its best. Quality craftsmanship and careful detailing create the ultimate blend of style, functionality, and brilliant design. A sophisticated entertainment center, the piece features open shelving, as well as two hidden compartments perfect for stashing dvds, board games, electronics, and media accessories. Free standing and easily moved, this stand will mix well with any decor and its artful grooves will create a statement in any space. Available in white, white and rustic brown, white and aqua blue, white and yellow, rustic brown, rustic brown and white, and rustic brown and yellow. 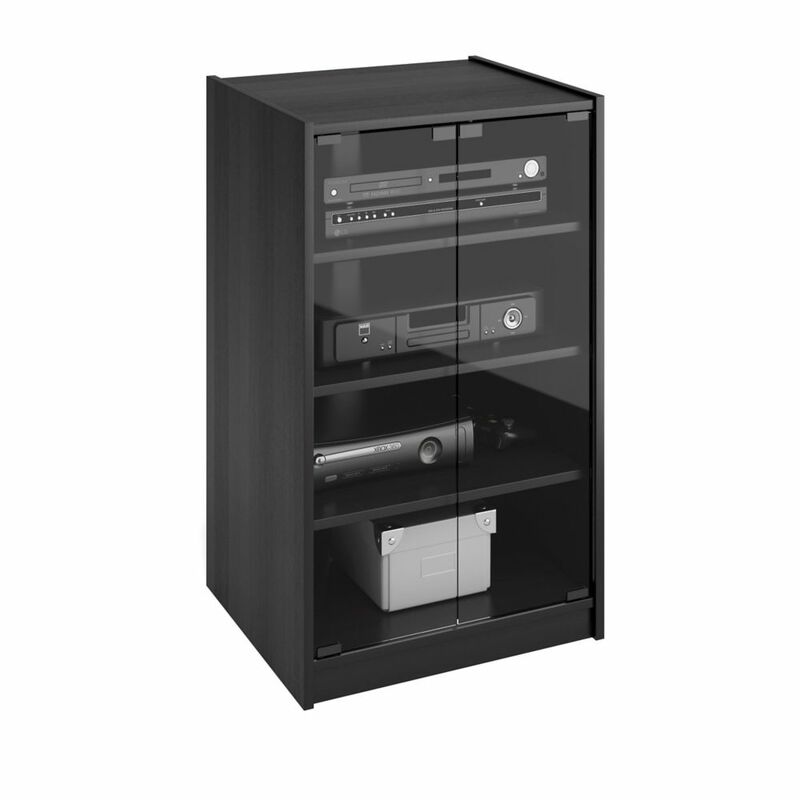 CR-2360 Cranley 21" Wide Ravenwood Black Component Stand House your components with confidence behind the tempered safety glass door of the new Cranley Collection component stand. Complete in our signature Ravenwood Black finish this sleek vertical design offers a contemporary way to maximize your living space. Adjustable interior shelves create custom space to store your components or add a touch of personal style. CR-2360 Cranley 21" Wide Ravenwood Black Component Stand is rated 4.0 out of 5 by 12. Rated 5 out of 5 by Kathy from Perfect for our conference room. Went together easily and looks very nice. Perfect for our conference room. Went together easily and looks very nice. Rated 5 out of 5 by lulu from I was surprised at how easy it was to put together and how sturdy it was. I was surprised at how easy it was to put together and how sturdy it was. I have ordered this online &amp; am waiting for delivery, however, there is some concern about the shelf depth. The diagram shows 18.5 &ldquo;, but some people are saying it is 15.5 &ldquo;. Can anyone settle this question. It is 15 1/2 inches front to back. Would it be possible to get assembly instructions or are they extra cost?